Dr. Guess may determine that you need a tooth extraction for any number of reasons. 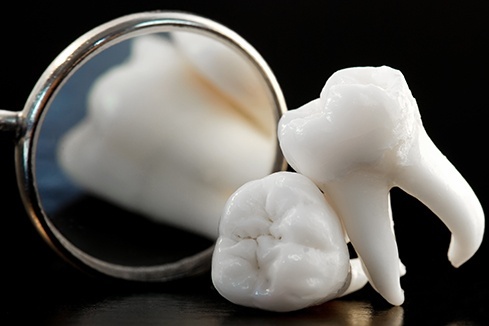 Some teeth are extracted because of severe decay, others may have advanced periodontal disease, or some may have broken in a way that cannot be repaired. Other teeth may need removal because they are positioned poorly in the mouth (such as impacted teeth), or in preparation for orthodontic treatment. The removal of a single tooth can lead to problems related to your chewing ability, problems with your jaw, and shifting teeth. All of these can have a major impact on your dental health. To avoid these complications, Dr. Guess will discuss alternatives to extraction and replacement of the extracted tooth. Some bleeding may occur. Placing a piece of gauze over the empty socket and biting down firmly for about 45 minutes can control this. This is a crucial part of the healing process and you must be careful not to dislodge the clot. Avoid use of a straw, smoking, or hot liquids. If swelling occurs, you can place ice on your face for 10 minutes and then take it off for 20 minutes. Repeat this cycle as you feel necessary for up to 24 hours. If you experience pain you may use non-prescription pain relief medications, such as acetaminophen or ibuprofen. After most extractions, make sure you do your chewing away from the extraction site. Stay away from hot liquids and alcoholic beverages for 24 hours. A liquid diet may be recommended for 24 hours. After the extraction, avoid brushing the teeth near the extraction site for a day. After a day, you can resume gentle cleaning. Avoid commercial mouth rinses because they tend to irritate the site. Beginning 24 hours after extraction, you can rinse with salt water (1/2 teaspoon in a cup of water) after meals and before bed. Dry Socket occurs when a blood clot fails to form in the socket where the tooth has been extracted, or the clot has been dislodged, and the healing is significantly delayed. Following the extraction post-op instructions will reduce the chances of developing Dry Socket. Dry sockets show up as a dull, throbbing pain, which doesn’t appear until 3 or 4 days after extraction. The pain can be moderate to severe and radiates from the extraction area. Dry socket may cause a bad taste or bad breath and the extraction site will appear dry. Dr. Guess can apply a medicated dressing to the dry socket to sooth the pain. After a tooth has been extracted, there will be a hole at the extraction site. In time, this will smooth and fill-in with bone. This process can take many weeks or months. However, after 1-2 weeks, you should no longer notice any discomfort or inconvenience.